Jurnal Infomedia is a scientific journal managed by the Department of Information and Computer Technology with the fields of Informatics Engineering, Multimedia, and Networks. This journal received research articles from various circles, such as ICT researchers, Network researchers, ICT students, ICT practitioners, Industry, and Communication and Technology Agencies. Jurnal Infomedia is published twice a year, namely June and December, published in print and full online (ojs). Each article submitted must follow a template article provided by a journal, and written in Indonesian or English. Articles must also be in accordance with Focus & Scope journals. The editor will do a plagiarism scoring of the article and assign the reviewer to do the review process before publishing, if your article is accepted, it will go into the editing, layout, and finalization of the article. Jurnal Infomedia invites Mr. / Mrs. of authors as like as Lecturers, Researchers, and Students to submit your manuscript of research results to our journal for publishing in Volume 4 Number 1 June 2019. Deadline submission: 30 May 2019. 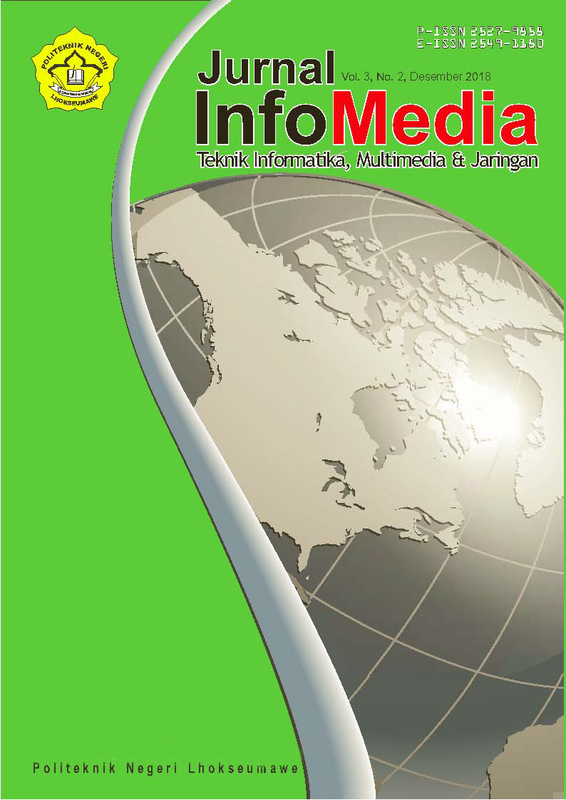 Jurnal Infomedia was published by the Department of Information and Computer Technology of the Lhokseumawe State Polytechnic as a research communication media in the fields of Information Technology, Information Engineering, Multimedia, and Networks or recent research in the field of computers. Publish 2 (two) times a year in June and December. Articles that enter will go through a double-blind review process by journal editors.